Sometimes pressing a button and hearing a beep just drives you crazy. We know. Below we received some video of a problem where the operator could not move the piston burette up or down on their automatic titrator. We decided to replicate the problem and then show how to take corrective action. We hope you find the video informative even though it is raw footage. Send us your questions too. Video, audio, pictures, etc. We can use any format. 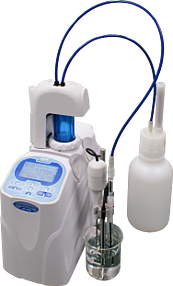 The AT-700 automatic titrator provides operators a variety of choices including the use of an integrated mini sample changer. The mini sample changer can hold up to 6 samples. The design utilizes a rotating arm that holds the electrode(s), dispensing nozzle(s), and propeller stirrer above each sample and maneuvers from sample to sample. The compact design allows a small footprint on the bench because the titrator sits on top of the sample changer. 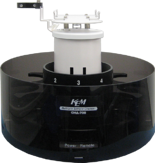 Watch the short demo video to learn more about this titration system. 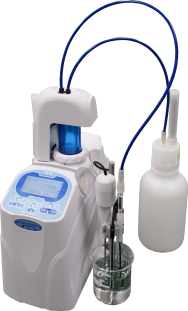 The AT-700 automatic titrator is a new compact potentiometric titrator. The unit is ideal for conducting basic end-point titrations all the way up to more complex configurations that can include a sample changer, an additional permanent burette, to a chain of 8 automatic piston burettes (APBs). The titrator can work stand alone or pair with advanced computer controlled software. Watch the video to learn and see more.